Social network share to Facebook, Pinterest, Twitter, & LinkedIn with a click of a button. You will appreciate receiving full-color graphical charts with details of visitors, and number of views in an easy to read format. We feature a full break down by day, month, quarter and year, sent conveniently to your email. We also show you truly unique and returning virtual visitors. On this report you will see the number of times your virtual tour has been viewed and what scenes were viewed the most. Use the RSS feed to AutoBlog so you don’t have to lift a finger to build more back links to your virtual tours and of course get more eyes on them. Use the RSS feed to create an automatic Hot Sheet that will get emailed out to your database. Simply pair your feed up with Aweber or your favorite email management system. Tour2QR automatically rips your virtual tours to a QR code. Enter the Width and Height of the QR code you would like to create, hit regenerate & copy/paste to your website, flyer or other marketing material. Anytime a viewer looks for more information they will have the opportunity to "Follow Tour" once clicked the system will ask the user to input basic contact information.The Tour the sends that user updates as changes occur to the virtual tour such as price and status of the listing. TourVibes allow tour viewers to give instant feedback from your virtual tours.Instantly collecting contact information, comments and more from visitors. Tour Vibes then writes back to your database and keeps a downloadable log for importing into your favorite CRM. Ever wonder who is sending your virtual tours, and to whom? Our Email Trapper tool gives you a list of the senders and recipients. If you’re an aggressive marketer and want to quickly build an email list of home shoppers, the Email Trapper will notify you each time your virtual tour presentation is sent. This is a perfect lead mining tool for agents who send monthly newsletters to home shoppers and sellers. Private Tour requires tour viewers to enter a password before the are able to view it. It serves as a wonderful lead generation tool as well as a way to give your clients peace of mind about their property and possessions. At the end of the day what you're looking for is more time to write proposals, to go after new clients, to reset, realign, and to refocus. With our Tour Toolbox you can make updates in a snap, such as price changes, profile adjustments, image arrangement, and more. Change your login and contact information for all your virtual tours, all in one easy place. Keep your Company info up to date on all your virtual tours, all in one easy place. Add a description or status banner to your virtual tours as well attributes for more in depth history and knowledge for people who view your virtual tours. Enhance your virtual tour and let your potential buyers or customers know all your new listing or commercial business has to offer. Make your virtual tour even more valuable, by giving them a printable flyer that can have access to right before they leave. We have over twenty flyer templates and layouts ready to make your gorgeous virtual tour complete. And best is we do all the work for you! When your virtual tour viewer use the “send-to-friend” feature, allow them to send much more than just a plain link. E-Brochures are slick, well organized and graphically pleasing alternative to the traditional email with a link. And the best part is when you purchase the integrated printable flyer we will give you the E-Brochure free of charge! We take adding Hot Spots to the next level with the addition of the Animated Hot Spots and Info Spots. Any Hot Spot within a virtual tour may link to additional virtual tour, different scenes or even link to your website or YouTube Video. Don't let potential clients and customers miss a thing with scene narration. Its a great way to personal present your new listing or commercial business as if you were actual there with them. Make a lasting impression, when you purchase a virtual tour, spiff up your presence by being on video introducing your new listing or commercial business. Looking for a way to "Wow" people with your virtual tour? AstroZoom grabs their attention with something they never seen before, an outer space fly in! In from outer space, directly to your property or business. Starts with a view of Earth from space, and then slowly zeroes in on your listing or business. What good is a floor plan if hidden in the background and only becomes available if the user clicks on a floor plan button to view it? 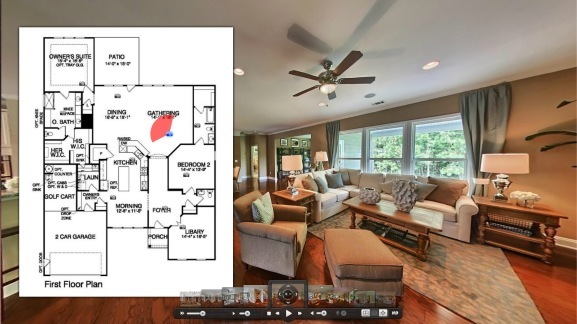 Our Floor Plans integrated into our virtual tours. They remain in place over the images while people pan from room to room. They even allow viewers to jump from one room to the next while providing a quick view directional compass.